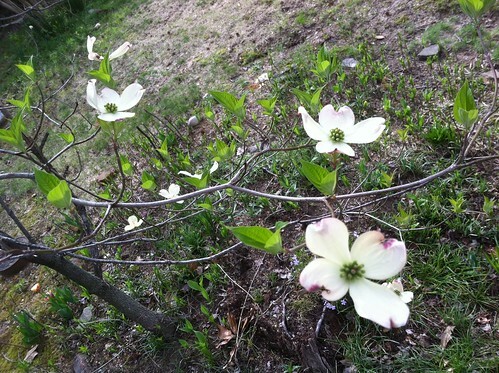 A Christian legend of unknown origin proclaims that the cross used to crucify Jesus was constructed of dogwood. As the story goes, during the time of Jesus, the dogwood was larger and stronger than it is today and was the largest tree in the area of Jerusalem. After His Crucifixion, Jesus changed the plant to its current form: He shortened it and twisted its branches to assure an end to its use for the construction of crosses. He also transformed its inflorescence into a representation of the Crucifixion itself, with the four white bracts cross-shaped, which represent the four corners of the Cross, each bearing a rusty indentation as of a nail and the red stamens of the flower, represents Jesus’ Crown of Thorns, and the clustered red fruit represent His Blood.